Double K Refurbish Conditioner is the ultimate conditioner for long-haired and thick-coated breeds. Loosens tangles to make combing out easier. 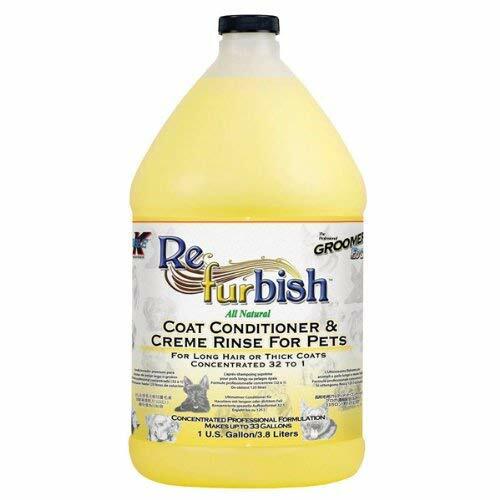 Helps loosen the undercoat during shedding periods. Leaves the hair silky, shiny and managable. Enriched with Panthenol, Aloe and Vitamins A, D and E. Professional formula. Dilution rate 32:1. Can be used neat, or maximum dilution rate of 32 parts water 1 part shampoo. If you have any questions about this product by Groomers Edge, contact us by completing and submitting the form below. If you are looking for a specif part number, please include it with your message.